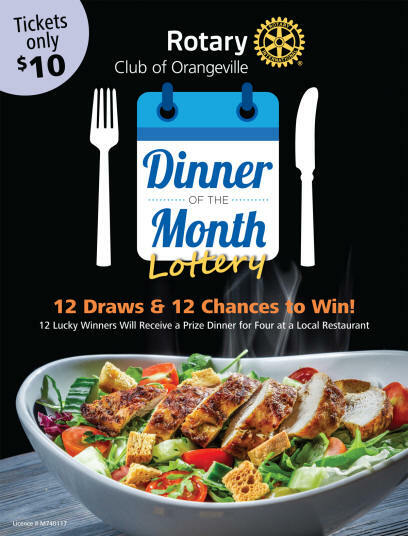 For $10 RCO’s annual Dinner-of-the-Month lottery gives ticket holders 12 chances to win a dinner for four at a local restaurant. This year the 12 participating restaurants are the Barley Vine Rail Co., the Black Birch Restaurant, the Bluebird Café, David’s, Forage, the Globe Restaurant, iNaka, the Mill Creek Pub & Restaurant, the Millcroft Inn & Spa, the Mono Cliffs Inn, Ray’s 3rd Generation Bistro Bakery and Steakhouse63. Lottery proceeds will be shared with our selling partner Friends of Island Lake; funds raised by RCO will be directed to Rotary and community charities. 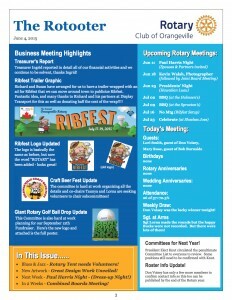 For tickets please contact rotarycluboforangeville@gmail.com. Operates under license number M740149.